To the Research Dept. — I have an ancestor to add to your Veteran files. 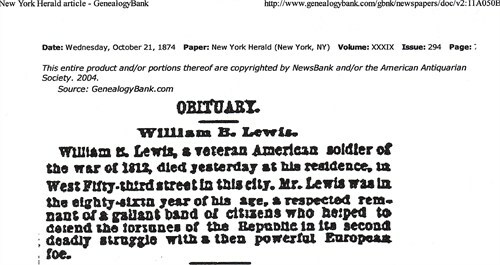 His name is William B. Lewis and he served in the War of 1812. He was born about 1788 in New York and died 20 Oct 1874 in New York. He was originally buried in a private vault in the church yard of the 18th Street Methodist Episcopal Church. The copied article below states that there was a ban on burials below 86th St. after 1851. 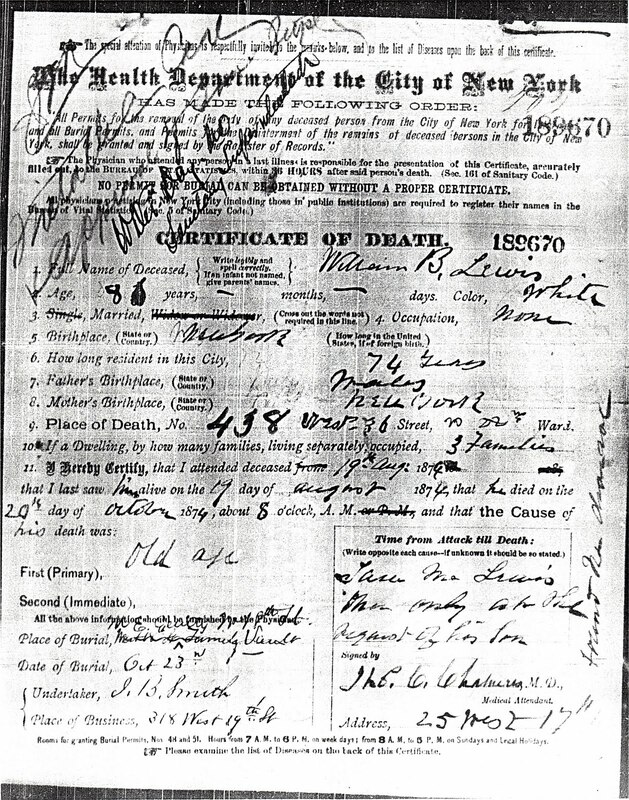 But if you look closely at his death cert. it states that he was buried in a private vault at this church. I can’t explain this. Also the article is incorrect as it says Woodlawn Cemetery is in Queens. Elmira M. Lamb Glaze was born in NYC abt. 1857, the daughter of Chester Lamb & Catharine Malory Lamb. She was raised a Roman Catholic & was one of eight children. Her father, Chester Lamb, was a well known horseman & livery stable owner in NYC. Her father was born in Vermont & her mother in Ireland. Elmira had lived in a convent before she met & married George Glaze. George was a widower with two children. After George & Elmira’s marriage, they went to live with George’s parents in New Jersey. George’s parents did not approve of Elmira & treated her very badly. George abandoned Elmira soon after their marriage. Tragically, she gave birth to a baby girl who died the day she was born, 14 Aug. 1879 in New Jersey. It was alleged that George & his parents refused to give Elmira the food she needed for her pregnancy. 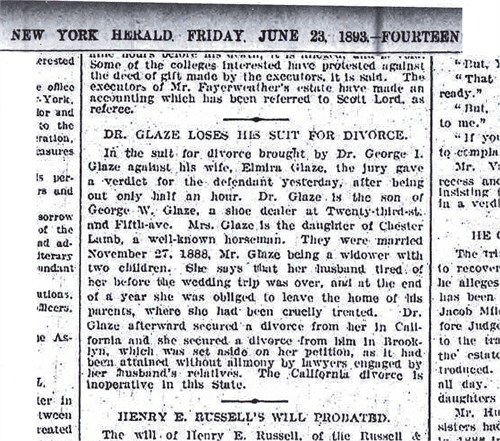 George & Elmira’s divorce was covered on the front pages of the New York papers as it was scandalous for this time. 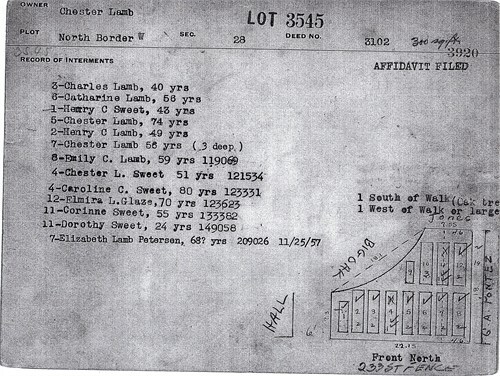 After George left Elmira, she moved home to live with her father, Chester Lamb. The divorce case dragged on for years. Their divorce was finally granted in June of 1893. 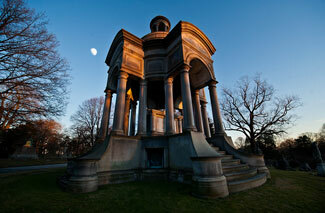 On Oct. 6th at 7pm, Woodlawn Cemetery is hosting an event titled “Moonlight & Mausoleums – Walking Tour”. They will be opening the Belmont, Harbeck & Julliard Tombs to allow walkers to view the interiors. A reminder — bring a flashlight. Chester Lamb was married to Catharine Malory. Catharine was born about 1819 in Ireland and died on 6 April, 1875. I haven’t been able to find where they were married or when she emigrated, but it appears that she came to the United States as a child. Chester & Catharine had eight children that I have found. All children were buried with Chester & Catharine in the Lamb plot at Woodlawn Cemetery except two, William George & Martha. On the 6th inst, Catharine, the beloved wife of Chester Lamb, in the 56th year of her age. The relatives and friends are invited to attend the funeral, from her late residence, No. 154 West Forty-fourth street, on Friday, 9th at ten AM; thence to the Church of St. Paul, Fifty-ninth street, where funeral services will be celebrated. I have been doing genealogical research for a couple of years and have amassed a huge amount of information. I decided that a blog would be the best way to share what I have found. Since I was adopted, I will add info. about both my adopted family and my biological family. When I was recently visiting Marissa, Alex & Zenda in Brooklyn, we all took a drive to Woodlawn Cemetery in the Bronx. After searching the records there with the help of the cemetery office, I counted 37 relatives (that I know of) buried there. 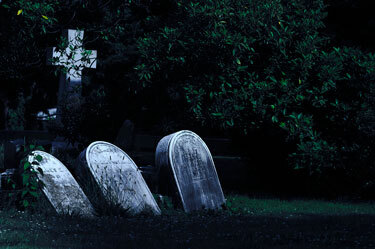 Woodlawn Cemetery has been in existence from 14 January 1865. More than 310,000 people have been interred there, including a lot who were disinterred from Manhattan. Many of the older cemeteries were dug up & the bodies reburied to make way for new construction. 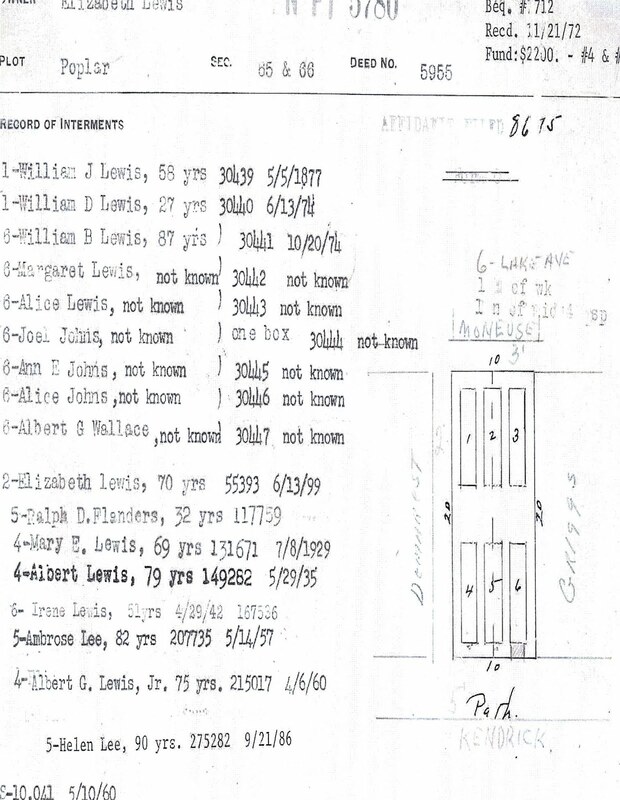 Below is one of the family plots from Woodlawn. The obit. 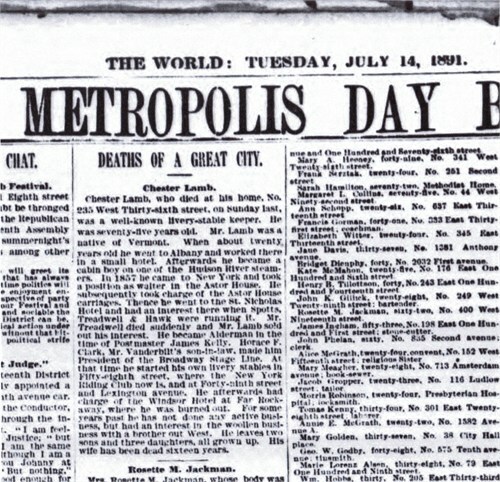 below was in the New York Herald on 14 July 1891. Chester Lamb, the well known livery stable keeper, died of kidney trouble at his home, No. 235 West Thirty-sixth street, yesterday. He was born in Vermont in 1817. Coming to New York he became a waiter in the Astor House and next bell boy. Then he was placed in charge of the Astor stables. He went from there to the old St. Nicholas Hotel where he made a fortune. He was Assistant Alderman under James Kelly. He was made president of the old Broadway stage line. He kept for many years the Fifth Avenue Stables which he sold to the Fifth Avenue Riding Academy. He leaves two sons and three daughters.